Shipping $10.29 Add item to cart for shipping estimate. You can SAVE on shipping by buying multiple items from the same seller. Shipping is charged by each individual seller. Sellers at times may also provide FREE SHIPPING on select items or on entire order if it meets the minimum order value. Please check sellers page for more details. Ganesha also known as Ganapati and Vinayaka, is one of the best-known and most worshipped deities in the Hindu pantheon. His image is found throughout India, Devotion to Ganesha is widely diffused and extends to Buddhists. A well modeled deity figure chiseled from a solid block of dense sandstone. With these religious sculptures, you can add an element of inspiration and positive energy to each of your favorite spaces. It is a fantastic good condition piece for collection. Ideal to gift someone or just to treat yourself. You can also put on table. Shipping Cost $10.29 Buy multiple items online from Indian Root to SAVE on shipping. This item in Religious Figurine & Sculptures category was first added to our catalog on 08-08-2018. 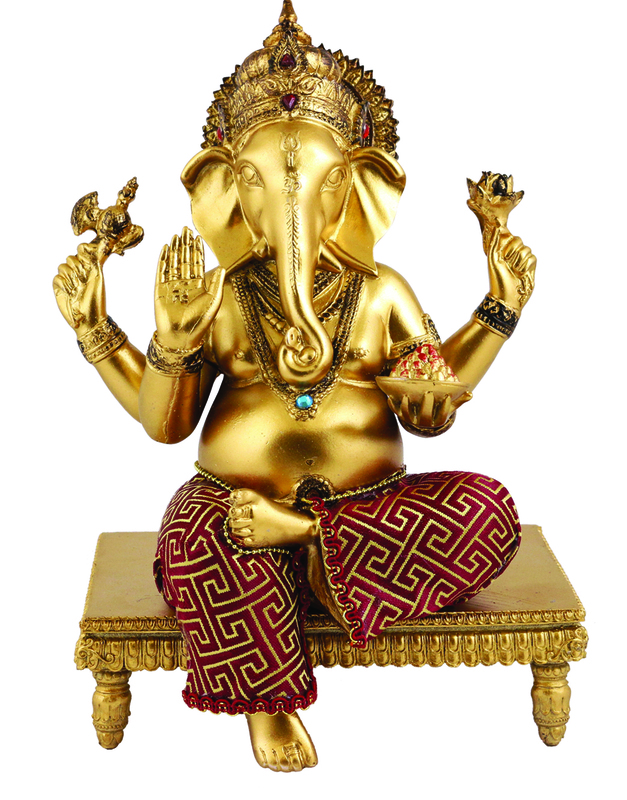 Buy Hindu Ganesha Figure - A colored & Gold statue of Lord Ganesh, sold & shipped by Indian Root where you can shop online for Exclusive Collection of Ethnic Indian Gift & Home Decor Item. This Ganesha Statue collection has been tagged as Brass Finish Ganpati Sculpture, Idol, Large Ganesha Murti, Return Housewarming Gift, Religious Deity Item, Pooja Figurine Hindu God Statue.